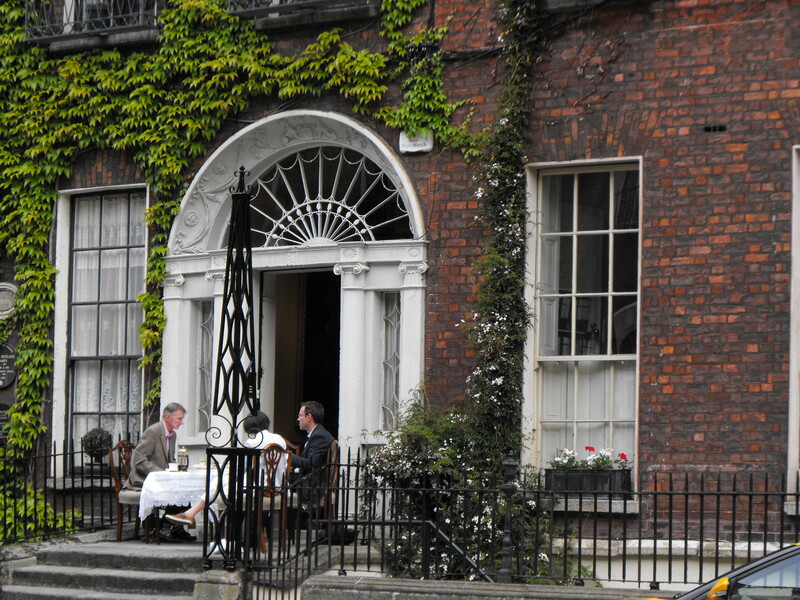 Leopold Bloom may have eaten “with relish the inner organs of beasts and fowls”, but the Ulysses fans gathered for a special Bloomsday breakfast at the James Joyce Centre in Dublin this morning came more for the entertainment than the food. As 40 guests picked their way around the grilled mutton kidneys which gave Bloom’s palate “a fine tang of faintly scented urine” in Joyce’s novel, actors Les Doherty, Elaine Reddy and John O’Donoghue brought Ulysses scenes to life around them. Between vignettes, Sinead Murphy and Darina Gallagher performed jaunty musical numbers featured in Ulysses, such as Those Lovely Seaside Girls and My Girl’s a Yorkshire Girl. 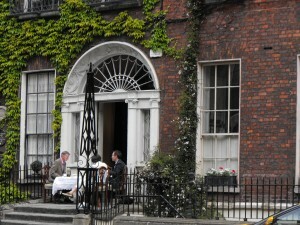 “The breakfast was held in the Gresham for a number of years, but it is back in the centre this year, which is the right place for it,” said Bob Joyce, grandnephew of the author and a director at the James Joyce Centre on North Great George’s Street, who attended the first of three breakfast sittings at 8am this morning with other members of the Joyce family. Nancy O’Donnell (63), a retired accountant from Wisconsin who was at the second breakfast with her husband John (70), has been looking forward to the day for months. The couple were accompanied by 13 other members of the Sierra Club, an American environmental group, who are in Dublin as part of a two-week literary tour of Ireland. Rolf Jester (64), a market researcher from Australia, also timed his week-long trip to Ireland with his wife to coincide with Bloomsday. “I am a Joyce fanatic, and would usually mark the day in some way at home. It is not a big event in Australia, but it is catching on,” he said, rising from the breakfast table to get ready to take a walking tour of Joyce’s Dublin. Walking and cycling tours, re-enactments, talks and music recitals celebrating the writer and his works have been taking place all around Dublin today. Writer Dermot Bolger hosted a series of readings and songs from Ulysses at Meeting House Square in Temple Bar, featuring contributions from the actor Frank Kelly, novelist John Boyne, and United Left Alliance TD Richard Boyd Barrett, who performed a reading with his birth mother, the actress Sinéad Cusack. St Werburgh’s Church on Werburgh Street hosted the Dublin premier of Bloomsday Story by Robert Gogan, a lighthearted approach which rattled through the whole book in the space of 100 minutes. 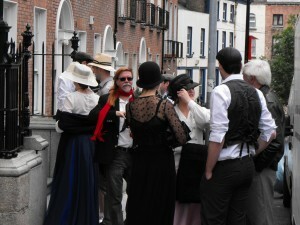 At the James Joyce Museum in Sandycove, visitors including the President’s wife Sabina Higgins, contributed to the celebrations with their own readings and performances throughout the afternoon, while the record for the most people dressed as Leopold and Molly Bloom was set at a vintage market and amusement park event in Dun Laoghaire, where 55 lookalikes were counted. Some 26 cities in 15 countries are taking part in a global reading of Ulysses as part of the Gathering, beginning at 8am in Auckland, New Zealand (9pm last night Irish time), which is the time the book begins, before moving westwards across the globe to end at 3.30am tomorrow morning in San Francisco. While the time taken to read will exceed the length of a single day in any one place, it will still all be happening on Bloomsday in the different cities where the book is being read. The participating cities are Auckland, Melbourne, Sydney, Canberra, Tokyo, Beijing, Shanghai, Singapore, Moscow, Pula (Croatia), Zurich, Trieste, Bangor (Wales), Dublin, Paris, Derry, Cork, London, New York, Montreal, Ottawa, Toronto, San Francisco, Chicago, Sao Paulo and Santa Maria (Brazil). The Dublin leg took place this afternoon in the James Joyce Centre and the National Library, where readers included writers Joe O’Connor and Declan Hughes, Impac award-winner Kevin Barry and musician John Sheahan. Novelist Colum McCann is involved in the New York event. Manager of the James Joyce Centre Mark Traynor said the Bloomsday celebrations have brought a great atmosphere to the city this week. 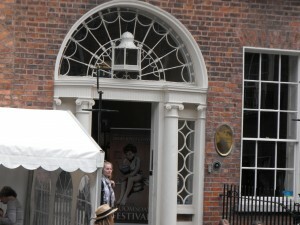 This entry was posted in Bloomsday review and tagged Bloomsday pictures, Bloomsday review, James Joyce, James Joyce Centre, James Joyce Tour. Bookmark the permalink.